1) Two-Spray Settings and 17 inch pull out hose. 6) This Faucet has a Unique White Finish Design and will add a UNIQUE STYLE TO YOUR KITCHEN for sure! QUICK EASY 1 OR 3 HOLE INSTALLATION for that Kitchen Faucet. No need for special skills or tools. INCLUDES Clear Installation Guide + Deck Plate + 2 flexible hoses (Cold-Hot) 45cm-17.7", Thread 1/2"
EASY LIFE FOR YOU-Unique Swivel Spout allows water to be directed wherever you need it. HIGH 11.5 INCH ARC SPOUT for plenty of clearance. The pull out sprayer wand helps you to clean the sink easily. 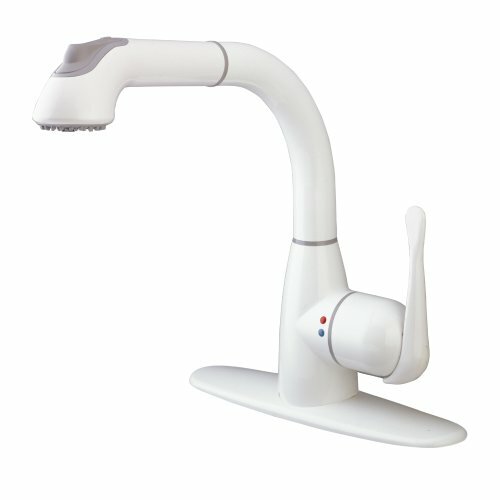 SMART 2-SPRAY SETTINGS: This CleanFloTM Single Hand Pull Out Faucet offers 2 unique spray settings: Rain Downpour & Aerated stream with a convenient unique design! LEAD-FREE AND MADE WITH ADVANCED POLYMER MATERIALS: That Kitchen Faucet won't rust, tarnish or corrode thanks to the High-Quality Polymer Materials! FAR BETTER than regular metallic kitchen faucets. 100% SATISFACTION GUARANTEE: Something happened to your Kitchen Faucet, you call us at our toll-free number and we help you to fix the situation instantly! If you have any questions about this product by CleanFLO, contact us by completing and submitting the form below. If you are looking for a specif part number, please include it with your message.